I love pasta. Who doesn't? I love it in tomato sauce, cheesy and creamy sauces, oil based sauces, baked, with veggies, without, cold, hot.. really any way you can make it, I'll eat it. I haven't been able to get my husband to eat whole grain pasta, so when he was away last week I cooked it. It definitely has more bite to it than regular pasta and takes a bit longer to cook, but other than that I didn't taste a difference. And not only did I like it, my daughter did too! 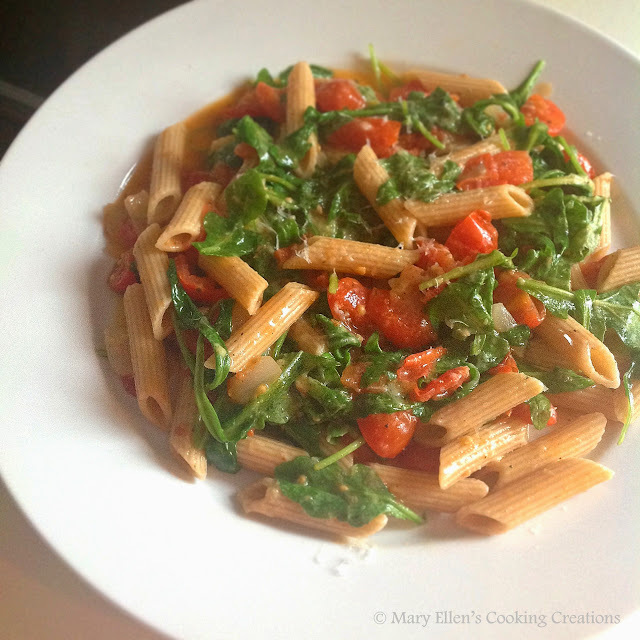 I served her pasta with some tomato sauce, and I made a fresh vegetable sauce with tomatoes and arugula that was so light and fresh and perfectly tart, and I loved the peppery notes the arugula added. Normally when making pasta this way I'd use chicken or vegetable broth to add some liquid. But in an effort to cook lighter, I only used some of the pasta water. Adding in some Parmesan cheese at the end made it creamy and added a touch of saltiness. Heat olive oil in a large sauté pan over medium high heat. Add the onion, garlic, and tomatoes. Season with salt and pepper and saute 3-4 minutes and then lower the heat and let simmer while your pasta cooks. After a few minutes add about half of the pasta water and let simmer another 2 minutes. Add the pasta and arugula; toss. Add the Parmesan cheese and adjust salt and pepper, if needed. Serve immediately. I do love a good pasta dish with simple, good quality ingredients. Love the whole wheat pasta!